That is a stele (or a fragment thereof) in the New Acropolis Museum in Athens. 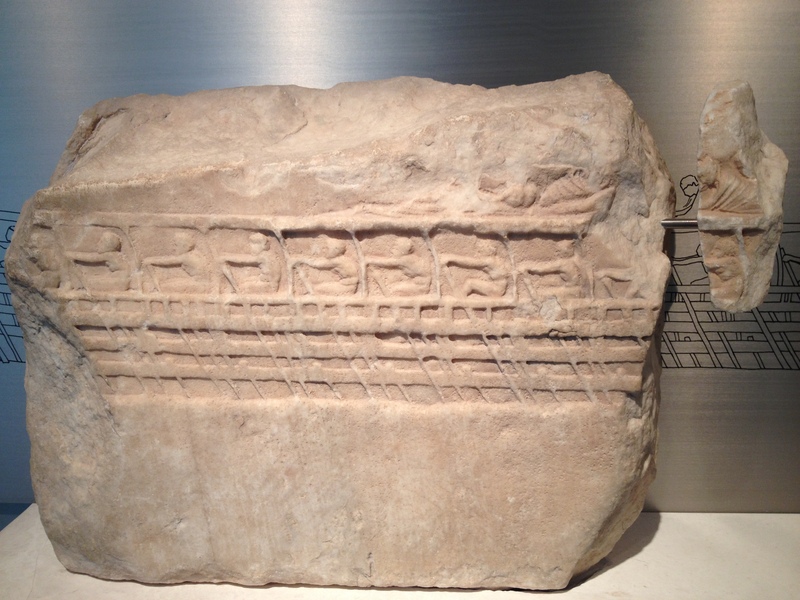 I was there last year with my Pen and Sword tour… which of course we’re doing again this year–anyway, I was looking at this stele, as one does, and I suddenly realized that I’d misunderstood the way a trieres (a trireme, or three banked galley) functioned. Or, more particularly, what it would be like to board such a vessel. In armour, against people trying to stop you. Really, Hollywood has it all wrong in almost every era (except Master and Commander, which was beautiful, I felt). The decks of warships rarely match up, and most ships in the age of sail (and even galleys) had a pronounced ‘tumble home’ or back angle, so that the ship at the waterline is often wider than the ship at the ‘top’. This makes boarding quite exciting–there’s a good few feet of nothing, a lot of angry men facing you down, and oh, by the way, if you miss your leap, you drown–but maybe you get ground to bloody paste between the hulls first. I guess that I assumed that the trireme had a solid hull with oar ports. In fact, I know what I was influenced by–I was influenced by reenacting. I’ve rowed a 16 oar gondola reproduced for the Lake Champlain Maritime Museum, and I’ve rowed quite a bit in a slightly smaller war-boat, an armed bateau of 12 oars. 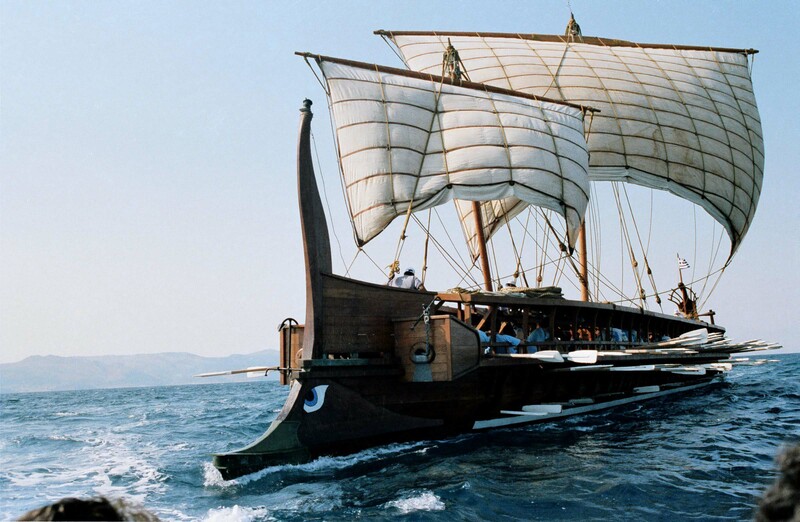 I think that I assumed–in some not-connecting-the-dots portion of my mind–that undecked (aphract, to those who read books about these things) triremes had–well–slab sides of heavy wood. USS Philadelphia under sail. 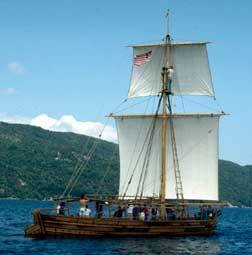 Philadelphia is a recreated 1776 three gun rowed gondola with a square rigged mast, built for service on the Great Lakes of North America. I was wrong. What is worse, I knew in a way that I was wrong all along–I understood the naval architecture of the trireme, and I’ve seen the Olympias. There she is–a real trieres, oars in and under sail. Look carefully, and you can see the rowing frames, and you can see the rowers. Now, see the problem for the boarders? Olympias is built, I believe, as a ‘cataphract’ trireme, or fully top decked. 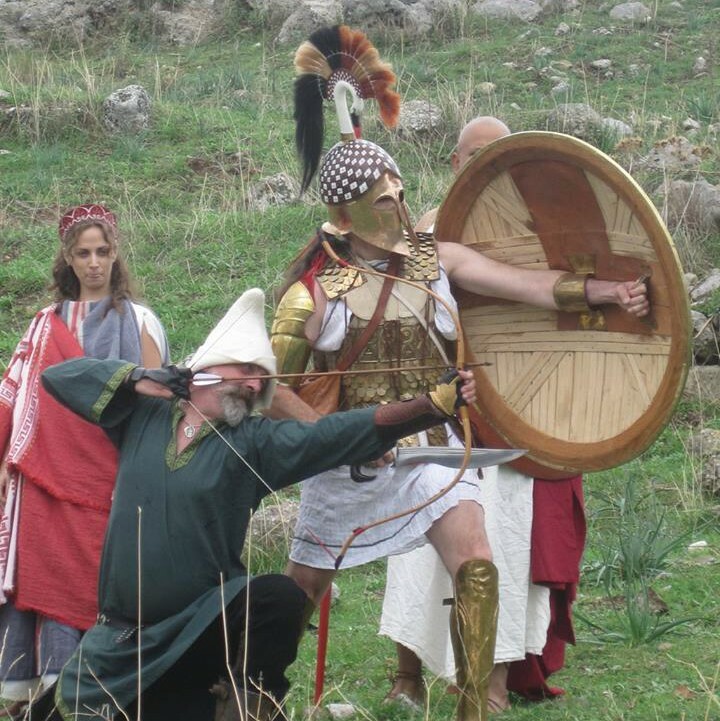 And there is some argument about whether Athenian triremes of the Persian wars were Aphract or Cataphract. Aphract is faster and more maneuverable and much less stable. Cataphract is heavier and carries more marines. I have just finished Long War Book V, called ‘The Wooden Walls’ about the battle of Salamis. Boarding combat has now changed–open rowing frames are now a problem to be faced. I was wrong, and I can’t go back and fix my slap-sided ships in the last five novels. Oh, and I apparently had the process of anchoring wrong, too. Luckily, a fantastic new book called ‘Seagoing Ships and Seamanship in the Bronze Age Levant’ set me straight, and if you like all this stuff, you need a copy. Anyway, back to study and more writing. Its time for more Tom Swan in the next few weeks. Oh, and book reviews.